Interplast volunteer speech pathologists and physiotherapists have worked with Fiji National University to incorporate training on cleft care in the physiotherapy curriculum for final year students. Read on to see how Interplast is helping local health professionals like Fijian physiotherapist, Queresha Ali, to specialise in this important area of expertise. Volunteer speech pathologist, Sarah Florisson, said there is currently no speech therapy department in Fiji, and Interplast allied health volunteers have been working together with local health professionals and educators to fill this gap. “Our emphasis has been on training physiotherapy and nursing staff at Colonial War Memorial Hospital,” she said. Each year, dozens of cleft lip and palate repair operations are undertaken by local surgeons in Fiji, with mentoring support from Interplast volunteer surgeons. Children being operated on are very young – intervention at such a young age is integral to better health outcomes because without surgery, babies cannot feed properly and may become malnourished, and children may face speech and communication difficulties as they become older. Queresha Ali is a Fijian physiotherapist who is eager to leverage her paediatric background to specialise in speech therapy for children. She has been taking part in training workshops facilitated by Sarah and fellow volunteer speech therapists, Hannah van Tuil and Melissa Parkin. “The program has provided me with a pathway to new learning opportunities and I feel this has given me an insight into what I want my future career to be; helping children with cleft lips and palates,” Queresha said. 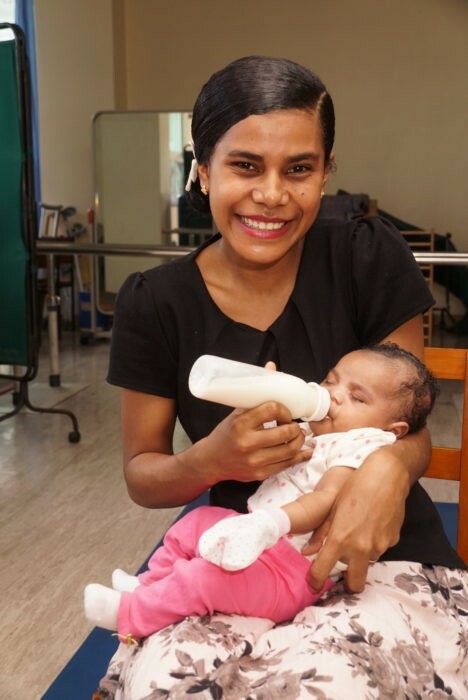 Queresha said having a thorough understanding of cleft lips and palates and complications arising from these conditions are the most important skills she has learned from a recent allied health training program in Suva this year. “I learned how to assemble a pigeon left bottle and how to teach parents how to use it on their babies effectively, how to conduct an oral examination and other therapeutic speech management issues,” she said. Queresha’s professional development has grown with each of the three Interplast training programs she has participated in. “It feels wonderful to know that I am making use of my four-year study and experience by giving back to my community and not forgetting that every day is a new day for learning and professional development,” she said. Interplast is one of the few voluntary organisations that mentors and supports the local medical staff in the hospitals in which they operate. In donating to Interplast you not only change lives forever but add to the skills of in country medical staff who are then able to make a huge difference in their communities. If you would like to help Interplast to repair bodies and rebuild lives donate today.